Yesterday was one of my favorite kinds of days. It was a baking kind of day! It started out with a cooking class at a local foodie store. I learned how to make french macarons! They were so cute and tasted great, and I had a blast. I’m definitely going to play around with some flavors so you might just see a few end up on here. When I got home, The Kid was dying to try something that she could enjoy. 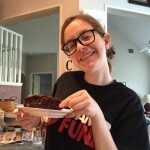 I ended up playing around with my Double Chocolate Muffin recipe and my Fat Free Banana Bread recipe. You know what happens when those two merge into one? 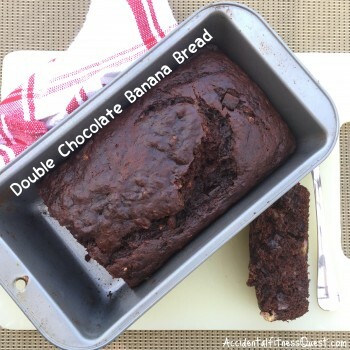 You get double chocolate banana bread. Hmmm, I end up with a lot of double chocolate going on here. I guess single chocolate isn’t enough in the Quest Kitchen, LOL. One time saving tip for you. If you read foodie baking recipes, you’ll see that they have to measure and sift the dry ingredients into one bowl. The wet ingredients get added to another and beaten until light, fluffy, and creamy stuff happens. I don’t have the time or patience for that so I tend to skip all that fanciness. I measured everything together into the same bowl at the same time, and mixed. Yes, the texture may not pass Gordon Ramsay’s palate test but for the average person I’m betting you won’t notice. Preheat your oven to 350 degrees and spray a 9×5 inch loaf pan with non-stick spray. Mix all ingredients except the chocolate chunks in a bowl until moist and well blended. Stir in the chunks. Pour into the prepared loaf pan and bake at 350 degrees for 50-55 minutes. Remove from oven and cool almost all the way before slicing. Makes 10 slices at approximately 206 calories each – 4g protein, 34g carbs, and 6g fat. The cooking time will vary a little bit depending on how big and/or ripe and mushy your bananas are. Bigger and more mushy will take closer to 55 minutes, and smaller and less ripe closer to 50 minutes. If you don’t have a loaf pan, don’t worry. You can make these in muffin form or even spread it in a 9×9 inch baking dish. If you notice the crater at the top of the loaf and you’re wondering what happened there, I’ll give you a hint. Someone got to the banana bread as it was cooling and I had my back turned. I won’t name names, but I do have photographic evidence. 😉 This stuff was seriously good. A single slice will be very difficult and don’t even think of spreading peanut butter on a warm slice! You’ve been warned.